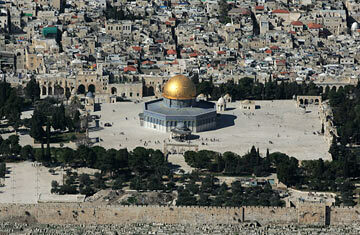 An aerial view shows the Dome of the Rock in Jerusalem's old city. When Canadian businessman Sam Ismail brought his wife and five children to visit his brother's family in Ramallah last week, he planned to stay for 10 days and tour both Israel and the Palestinian territories. They had flown into Amman, crossed over to the West Bank. Knowing that Palestinian Authority license plates are banned in Israel, Ismail reserved a car at an Israeli rental company. But, when he got to Israeli border control, he was shocked to discover that his Canadian passport was stamped "Palestinian Authority Only." "Last time they came, they visited Acre, Haifa, Jerusalem  the whole country," Ismail's brother Nedal, who lives in the West Bank, told TIME. "This time they packed up after 96 hours and spent the extra week in Jordan instead." Ismail had fallen afoul of an Israeli border policy, quietly begun in June, that bars foreigners who say they are visiting the Palestinian Authority from entering Israel. Israel says the visa helps to exclude visitors who threaten security. According to Israeli Interior Ministry spokeswoman Sabine Haddad, the procedure is based on an unpublished 2006 decision by the Israeli interior and defense ministers that "any foreign national who wants to enter the Palestinian Authority must have a permit issued by the army, and entry is permitted only into PA territory." Palestinians say it violates international law and the promise of unhindered movement for foreign travelers under the 1995 Oslo II Accords. "Israel wishes to strictly regulate travel of visitors who come to the country, especially those curious to see the West Bank," says Toufic Haddad, a Palestinian-American activist. The policy has affected U.S. citizens. This week, Betty Najjab, an American from Centreville, Virginia and the widow of a Palestinian, was given one of the new visa stamps after visiting in-laws in Jordan. She told TIME she didn’t know if she would be able to fly home: the return leg of her ticket departs from Israel’s Ben-Gurion airport. "We have made it quite known to the Israeli Government... that we expect all American citizens to be treated the same regardless of their national origin," U.S. State Department spokesman Ian Kelly told reporters this week. "These kinds of restrictions we consider unacceptable." "It is being applied in an arbitrary manner," Salwa Duaibis, Coordinator for the Right to Enter Campaign in Ramallah, told TIME. "It depends on the discretion of the person sitting at the border. If you want to go and visit family in Jerusalem and you get this visa, then your whole plans are thrown out of the window." The new policy is alienating businessmen like Khaled Sabawi of London, Ontario whose family has for years fostered investment in Palestine and whose father Mohamed was on the board of the Peres Peace Center. Sabawi runs the Ramallah-based MENA Geothermal, one of the first green energy companies in the Middle East. He has spent nearly three years traveling between Canada and Ramallah on three-month Israeli tourist visas. Last January, Sabawi was suddenly turned back at the border crossing from Jordan. Subsequently, he was denied entry twice. Since June, his visa has restricted him to Palestinian territory. Says Sabawi: "I find myself being racially profiled, interrogated by security officials and forced to wait for up to eight hours at the border." " "I can't meet with Israelis any more and lots of our equipment comes from Israeli manufacturers. I can't buy from them if I can't meet them to negotiate," Sabawi told TIME. "We will withdraw our investments if we can't be here to oversee our businesses. It will simply be too risky for us to invest in Palestine."